In a trilogy pertaining to cryptid monsters, I find it fitting that the final book in the series centers around the most horrible monster of all - man. The evil that man has inflicted on each other is astounding to think about. Hatred and bigotry come front and center in Schweigart's The Devil's Colony. Ben and Lindsay are once again called on by billionaire cryptozoologist, Richard Severance. This time, it's to infiltrate the compound of neo-nazi Henry Drexler. Henry is the son of a former Nazi SS officer and scientist who was assigned by Hitler to find proof of the dominance and superiority of the Aryan race throughout history. Now Henry is using his family's fortune and remote camp location in the Pine Barrens Woods of New Jersey to welcome all neo-Nazis and white supremacists who want to join him in continuing his father's dream. But what else has Henry unearthed in his research of his father's past? 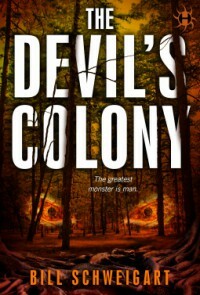 The Devil's Colony is different than the previous two entries in the trilogy. The first two, The Beast of Barcroft and Northwoods centers around the cryptid monsters that are unleashed and causing havoc. In The Devil's Colony, the story focuses mainly on the horror's of man and the cryptid monster is a side dish to come in during the last act. According to some reviews I've read, this difference may have tripped up a reader or two. However, it didn't spoil the story for me. I enjoyed Schweigart's tale and thought it hit many of the right notes. Perhaps, the cryptid portion of the story could've been sprinkled a little more throughout so that it didn't seem like two different stories trying to be mashed together. All in all, I enjoyed the trilogy and look forward to more from Bill.